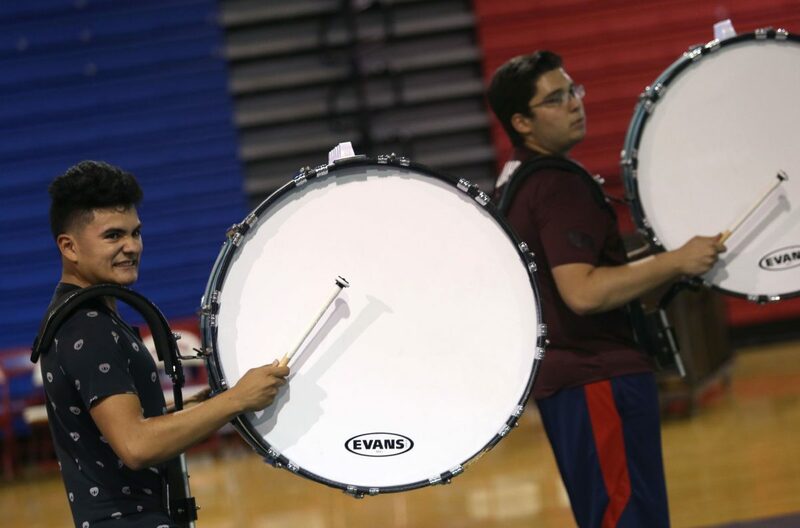 Mark Escalante, 16, plays the bass drum with the Edinburg High band during rehearsals Monday, April 16, 2018, in Edinburg. 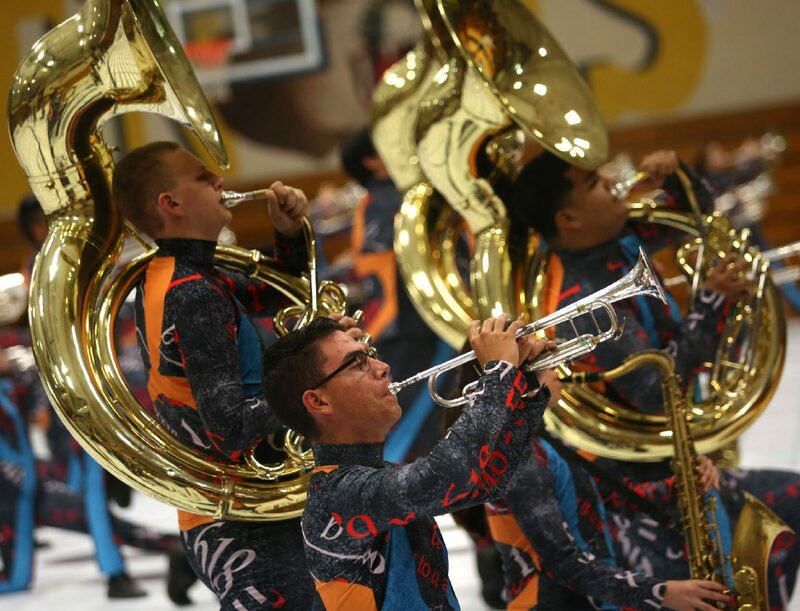 EDINBURG — Band students from two Edinburg school district high schools are preparing to take the stage this weekend at an international competition with from more than 300 other participants. The Winter Guard International Sport of the Arts World Championship begins Thursday in Dayton, Ohio, and continues through Sunday. More than 46,000 participants have competed in regionals for a spot in the 41st WGI world championship stage. 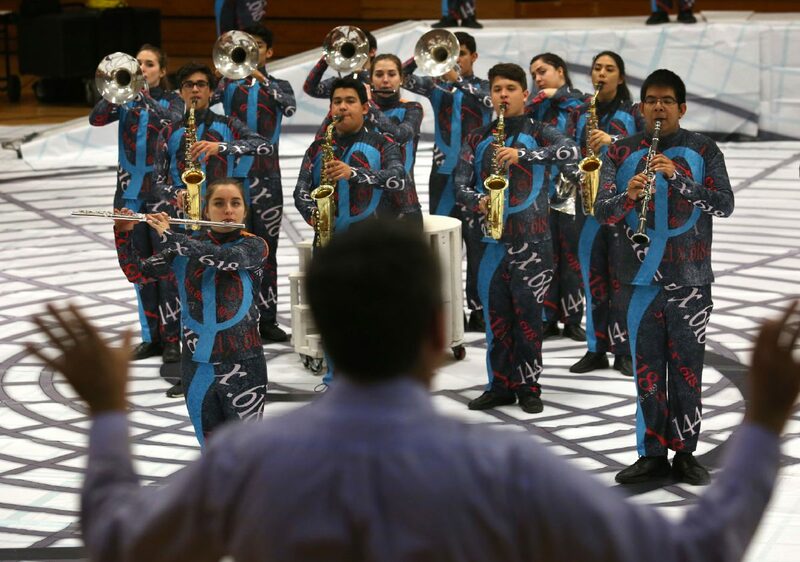 Though its only three years old, Edinburg North High School is sending its winds team to compete against similar ensembles from around the world. 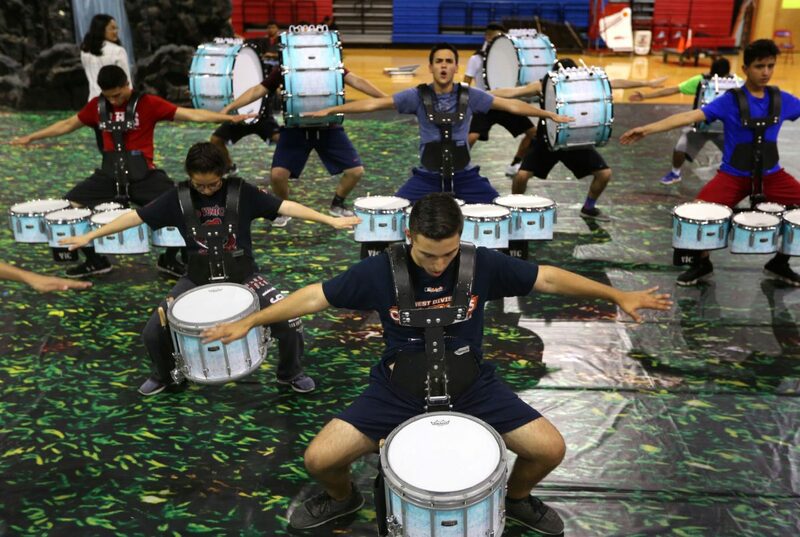 Edinburg High’s drum line will compete among 250 other percussionists. Oscar Garza, center, 17, dances with other members of the Edinburg High drum line during rehearsal Monday, April 18, 2018, in Edinburg. The percussion section of the band is competing in the Winter Guard International in Ohio over the next few days. 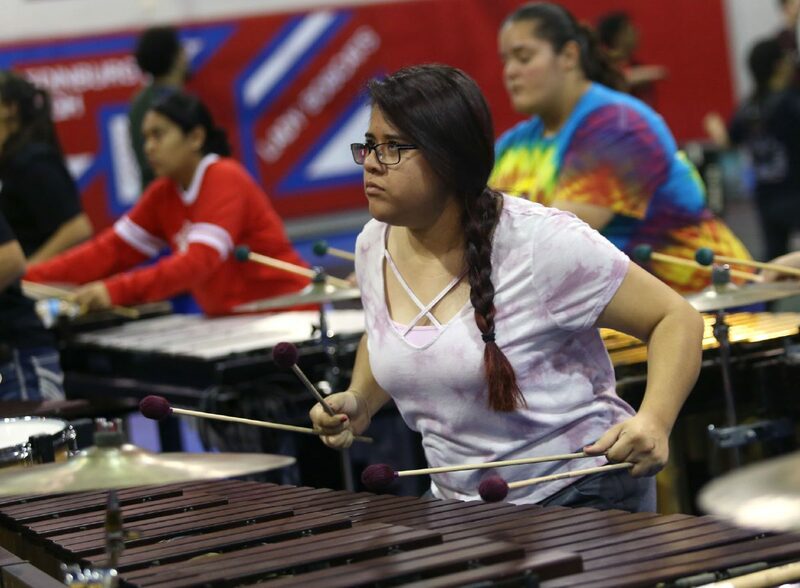 Athena Martinez, 17, plays the marimba with the percussion section of the Edinburg High band Monday, Apruil 16, 2018, in Edinburg. Samuel Martinez, 16, center, kneels while rehearsing for the Winter Guard International with the wind section fo the Edinburg North band Monday, April 16, 2018, in Edinburg. The wind section of the band will be performing a piece titled "In-Phi-Nity" over the next few days for the competition in Ohio. Part of the Edinburg North band's wind section watches band director Chad Dempsey during rehearsals Monday, April 16, 2018, in Edinburg. Jason Rogers, band director at Edinburg High School, said his team has been participating in competitions to reach this level for the last 10 years, which he said provides them a good opportunity to see what’s out there and commit themselves to trying to be the best as they represent not only their school but the region. Newer to the competition is the winds team at Edinburg North, as Director Chad Dempsey said they started the indoor team about three years ago. For those unfamiliar with it, Dempsey described it as essentially a marching band in a gymnasium and said his department created it in an effort to give the students a new avenue to perform and develop leadership skills by leading the inaugural group. Even though other competitions, such as the Pigskin Jubilee, and regionals keep the teams busy and practicing throughout the year, both directors said they worked hard to prepare for this weekend’s performance. The students return to the Valley on Sunday as the competition stretches over three days. The competition will be broadcast live at wgi.org.